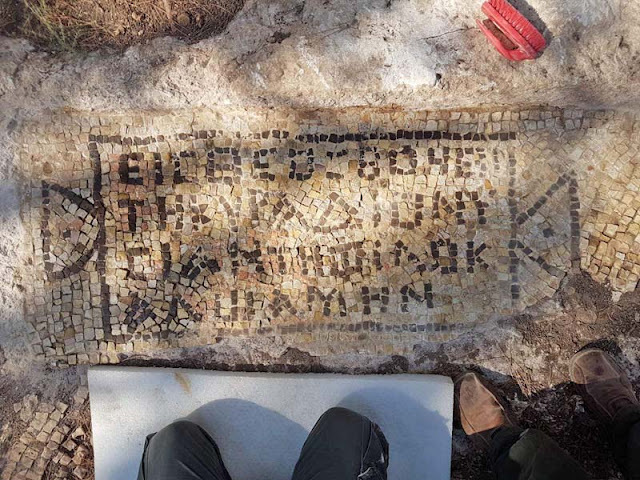 The estate, discovered in a major Israel Antiquities Authority excavation ahead of new neighbourhood construction initiated by the Israel Lands Authority, contains a rare inscription, adding to the evidence of once-extensive Samaritan settlement in the area. 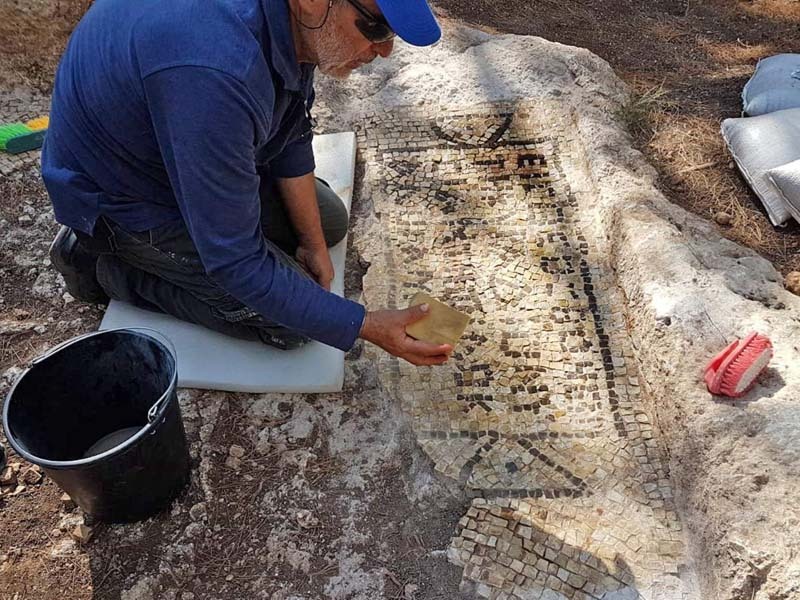 “Only God help the beautiful property of Master Adios, amen.” This is the 1,600-year-old inscription found in Israel Antiquities Authority excavations at Tzur Natan ​on the southern Sharon Plain. The excavations were carried out ahead of new neighborhood construction initiated by the Israel Lands Authority and ended this week. The inscription, in Greek, was deciphered and translated by Prof. Leah Di Segni of the Hebrew University of Jerusalem. It is dated to the early fifth century CE, the period during which Samaritan settlement reached the height of its power and prosperity in the southern Sharon Plain. Near the winepress the archaeologists discovered stone quarries with rock-cut depressions used for cultivating grapevines, apparently part of Master Adios estate. "Master" was an honorific given to senior members of the community and attests to the high social standing of the owners of the estate,” says Torge. “The location of the winepress is near the top of Tel Tzur Natan, where remains of a Samaritan synagogue were found with another inscription, and reveals Adios' high status,” she adds. The Tzur Natan Samaritan synagogue was transformed into a church in the sixth century. 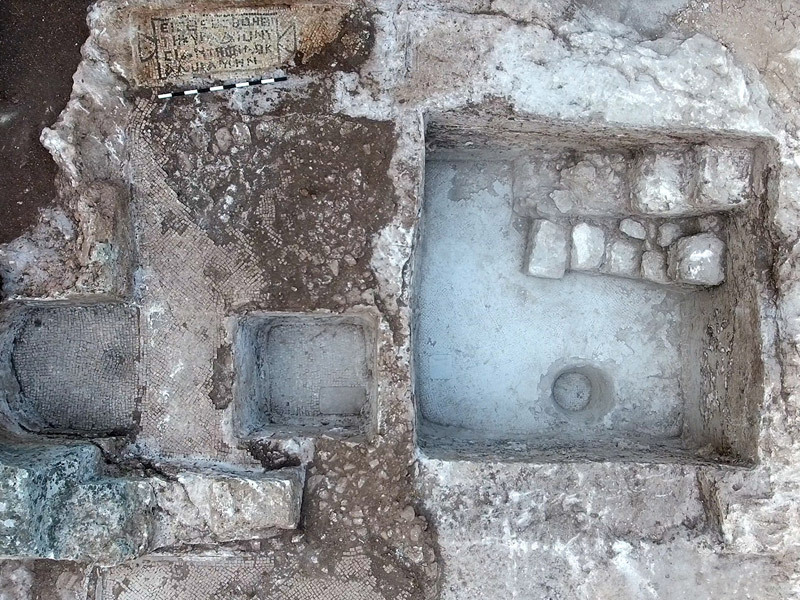 A compound was discovered nearby in the past, featuring large rooms and spaces for producing wine, oil and flour. In one of these a Pompeian donkey mill was found, used to grind flour and incised with a seven-branch candelabrum. The inscription in the winepress is additional testimony to once-extensive Samaritan settlement in the southern Sharon Plain during the Byzantine period. The Samaritans were originally brought to this country as part of Assyrian policy and first settled on and around Mount Gerizim. Over the years the population grew and expanded to the southern Sharon Plain among other places. They maintained their special customs and traditions, which resemble Jewish traditions in many aspects. During the Byzantine period the Samaritans revolted against the government in an attempt to maintain their identity. After the revolts the community diminished in size and returned to the Mount Gerizim area. A Samaritan community still lives at Mount Gerizim, as well as in the city of Holon south of Tel Aviv.